Nobita is trying to prove that the Monkey King exists so they went back to the time Sanzo began his pilgrimage. 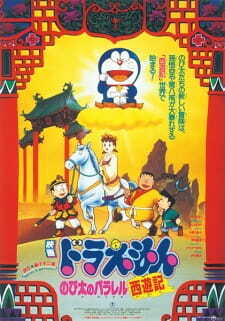 Doraemon used a virtual video game console and let Nobita play "Journey to The West" to give Nobita clothes that the Monkey King wears. Nobita messed up on prooving Monkey king exists. When Nobita and his friends played "Journey to The West" and they finished the game without fighting any demons. Later, they found out thier world is ruled by demons. The problem is that Doraemon left the game console open in the past without closing it and demons started to appear to invade the world. Doraemon and the others now have to go back into the past to vanquish the demons.